Blessed with a lean and fit body, Kapoor makes sure that he trains hard despite a tight schedule. He confesses that the transition from a plump youngster to a dashing actor has been difficult. It was only when he started his acting career that he realized the importance of having a fit body. Ranbir Kapoor does not favor spending hours in the gym. He credits his trainer, Pradeep Bhatia, who happens to be his close friend for motivating him to hit the gym and guiding him do the grueling workouts. While his workout sessions generally last for thirty to sixty minutes a day, the actor complains that his arduous work schedule does not leave enough time for exercises. 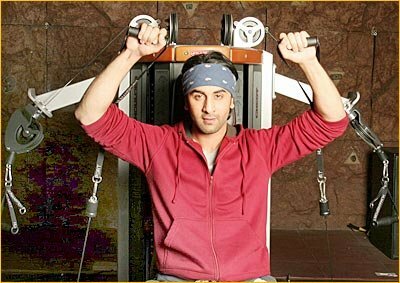 Whenever in town, Ranbir makes it a point to exercise in the gym five times every week. His workout starts with a ten-minute cardio and circuit training. This is followed by pull-ups, and crunches, as well as legs, abs, chest, shoulders, biceps, and triceps workouts. However, when he is traveling for shoots, he prefers practicing kickboxing and playing football amongst other things. Never miss your regular workout routine; if your busy schedule keeps you from hitting the gym, you can blend some outdoor activities such as playing football with your workouts. Stay hydrated by drinking lots of water, preferably 4-5 liters a day. Maintain a strict diet plan.